Same as for any other child, play is essential for the development of the child in every area: motor, cognitive, emotional, social. We are playing when we sing a song to the child, make funny sounds or faces to elicit her laughter or when we allow her to explore objects and drop them to the floor. Due to their difficulties with movement and posture, children with Cerebral Palsy have limited ability to explore the world. This does not mean that they are not willing to explore, as any other child does! Only that they may need more stimulation and an environment that facilitates play! Children with Cerebral Palsy are often less active or irritable. As a result, they tend to get less attention and interaction from their caregivers, which results in a vicious circle of the child becoming even more apathetic or irritable. This hinders severely the development of the child and is a common problem that needs to be addressed. Through play and playful interactions, both the child and the caregiver engage in pleasurable activities without the pressure of having to achieve a result. Often parents are expecting interventions that look like medical treatment or therapy, and forget that a child’s main activity is playing and that much learning and progression will be made through play. It is important that as a Healhcare Professional we reinforce this message, that play is vital for development of the child. It is a good idea to engage also other siblings or children in the family, neighborhood and school, as they will be naturally ready to play! Play is an important part of any child's development. It is an activity that makes a child happy and is enjoyable so that they want to do it again. Play is one of the most important ways that children develop mentally, socially and physically. It gives a chance for a child to practice doing activities in their own way so that the child can be successful, as the child grows the way of playing changes. The sequence in which play develops is the same for all children, whatever their abilities or handicaps. Playing Alone (Till 1 Year): At first the child will play with his body and then will gradually begin to reach out to things he sees nearby and play with them. She will not be interested in other children or anything they are doing but she will like other people playing with him/her. Watching Others Play (1.5 -2 Years): The child will stop with what she is doing and watch other children who are playing nearby. But she will not join them in their activities. She likes to repeat things many many times. Playing Next to Others but Not with Other Children (2-3 Years): From a distance it can look as if they are playing together, but in fact there is no direct communication between the children and they are all playing their own games. The child will hate to share toys with others. Beginning to Play with Others (3-4 Years): The child will begin to play and share toys with others. They will talk to each other about the game in progress, but the game has no specific shape or rules. Cooperating with Others in Play (About 5 years, Normally When they Start School): The child will play structured games with other children, taking turns and using rules. Rules for games become very important at this stage. Play is one of the ways that children learn to move from sitting, to crawling, and then to standing, and walking; they learn balance and coordination. The child learns to manipulate and handle objects and learn that objects are not part of their body; they first learn to hold objects and then to move them. Later they learn to use their eyes and hands at the same time. At the same time as learning to use the hands the child will be using mental abilities to learn about subjects; and develop imagination and creativity e.g. a comb can be a comb but also an aeroplane or a car. The child learns social skills through playing with others. Young children usually only think of themselves and in play they can learn basic ideas of sharing and what others want and need. The child will learn through talking, exploring possibilities and learning to express own ideas. The child will learn to cooperate with friends; the ability to work together with others is important. Through play the child will experience the joy of winning - and learn to cope with losing. Often children will use games to work through the things that frighten or worry them. They play out the roles and by doing this come to terms with their difficulties. e.g. a child who goes to the hospital often plays afterwards “hospital”, or “doctor”, or “nurse”. This may help to cope with the frightening experience. They also learn adult roles: children often play ‘father and mother’, teacher, etc. They also invent games to show skills like building houses or playing to cook. Often children will use games to work through the things that frighten or worry them. They play out the roles and by doing this come to terms with their difficulties e.g. a child who goes to the hospital often plays afterwards “hospital”, or “doctor”, or “nurse”. This may help to cope with the frightening experience. They also learn adult roles: children often play ‘father and mother’, teacher, etc. They also invent games to show skills like building houses or playing to cook. Therapeutic play can be harder to design than simple exercises as it takes more analysis and creativity. It needs to be challenging but at the same time the child needs to experience positive result and fun. The play should be adjusted according to the physical and the mental abilities of the child. Healthcare Professionals where possible should always adapt exercises into play activities. This may be more difficult but is also more rewarding. The child is 4 years old, so making puzzles (with 5 - 20 pieces) can be incorporated. Have two chairs at each side of the parallel bar. Put all pieces of the puzzle on one chair. The child has to bring piece for piece as the other child and making their the puzzle. When finishes talk about the puzzle, praise the child etc. Maybe the child can put a piece of the puzzle in his trouser pocket, or tie something around his arm or neck to carry from one side to the other. You also can use: blocks and build a tower or a house; stones and make a house. The child can sit in a corner and roll the ball instead of throwing it. Someone else can sit behind the child with their legs in V shape. The boy can sit between the legs and roll or throw the ball. Use a balloon, which is slower. therefore easier to control and handle. At the same time: let him succeed at least 3 of the 4 times. Count the goals etc. This game is not only good for sitting balance, but also for eye hand coordination, planning, strength, sense of direction and distance. Place the child in a position where the child can look at their hands, at the caregiver or other children playing with them, and where they can grasp toys and bring them to theirmouth. Change posture often and encourage the child to be active in each posture. Make play part of the daily routine. For instance, when you are bathing the child you can encourage him to splash water, or to play with a plastic toy as if it was a ship. Try to use play time to develop new skills, but remember it must be fun and pleasurable after all. Any good therapist should keep in mind that children learn better when they are having fun. Children with Cerebral Palsy love the same toys as every other child. The child needs to be able to grasp them, though, so consider shape and size. For some children a small ball will be easier to handle, while for others a larger one. 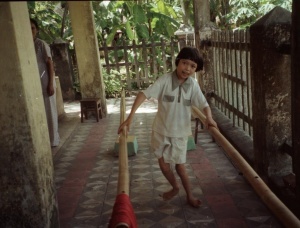 Regular toys can be easily adapted: a toy that is too small or hard to hold can be attached to a stick. Other toys can be held using an elastic band around the hand. Toys can be fixed to a table or the floor so the child with poor motor control can touch them or operate them. If a toy keeps falling to the floor, tie it to a piece of string so the child can bring it back. You don’t need to have expensive toys: a cardboard box with objects of different sizes and textures e.g. marbles, seashells, pieces of cloth, is great to practice holding, release and transferring. And empty plastic bottle with pebbles inside will make a great rattle. Spoons and empty pots can be used to make music or play make believe. Children are fascinated with pieces of wrapping paper that shines and make crinkle noises. Young children enjoy what is called sensory exploration. They are interested in colors, sounds and smells. Provide the child with interesting objects to look at, reach for, and eventually hold and explore with the hands and mouth. If the child has a visual impairment, make sure they have access to toys that make noise such as rattles or crinkle toys. One Switch. Switch Equipment Guides. Available at http://www.oneswitch.org.uk/4/DIY/ (Last Accessed 2 Sep 2016). Finally, if there has to be only one toy in the house, it should be a story book. Looking at a story book with a child, even if the parents are not literate, promotes the development of communication, cognitive and fine motor skills through pointing at the objects in the pictures, turning pages, etc. Most caregivers know already how to play with children. It may only be more difficult if the child doesn’t respond as we expect, or if the caregiver is grieving. Try to encourage any attempt at being playful and remind the caregivers how important it is for the development of the child. As children grow, they start becoming more interested in other children. It is important that children with cerebral palsy have the opportunity to engage in games with other children. This is a great first step towards inclusion and also a great learning experience for all children about the diversity of the human being. Overall play is an essential activity that is vital for the development and learning of any child, therefore it is paramount that a child with CP can participate in play as a therapeutic intervention. Play can be rewarding for both the child and the member of the family who are facilitating play. If therapy can be done through play, then play should be incorporated. If the treatment is fun the child and the relative are more likely to participate and the engagement of the child will aid development in many different areas.